Allow me to cut to the chase: our meal at Hablife, Hablis Guindy, was fabulous and I look forward to returning with more friends. 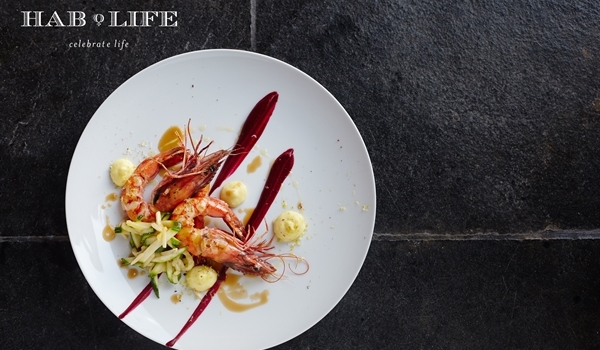 With a focus on fresh ingredients, sourced locally as much as possible, cooked slowly and carefully, chef Sathya Raj R, designated as the a�?wellness chef, joined Hablis earlier this year from the London Hilton on Park Lane and has brought his experience of modern British cuisine to bear upon a well-planned menu. 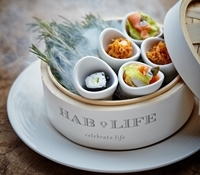 Hablife, which includes a spa, gym and pool, offers a limited menu that changes daily based on availability of fresh ingredients. Guests can choose from two or three course meals with an option of a special six course meal on two days notice. We cheat this format a bit, to get a sense of the vegetarian options. Our meal starts with a lovely complimentary pre-starter basket of a salmon brioche, crispy prawn and vegetarian sushi. I try the non vegetarian sushi option on the starter menu while my friend has the asparagus and sweet pea veloute. The former is competent while the latter is a creamy distillation of flavour. We also try the apple wood smoked cheese, beetroot puree with a parmesan crisp and mustard sauce. It is a well plated salad with an interesting mixture of textures, that is surprisingly filling. We find sorbets served between courses as palate cleansers a�� the first round is a delightful apple and ginger concoction. For the main course I try the seafood paella with red snapper and orange jam. I enjoy the mix of flavours with a hint of spice, but the orange jam is occasionally overwhelming. My friend tries the braised leg of lamb, cooked for 12 hours, and gushes at the texture of the meat. It is served with a salad featuring hazelnuts and a fabulously light take on the shepherda��s pie. Our second round of sorbets are litchi flavoured, prepping us for dessert. I try the guinness ice cream with almond crumble and chocolate brownie that is best enjoyed by guinness-lovers. The mascarpone mousse with chocolate soil and vanilla and coffee veloute, a take on tiramisu, is a more accessible dessert. The service is excellent, with waiters exhibiting an understanding of the menu and dishes. The meal itself was proof that healthy food can be tasty food.